I had heard a lot of interesting things about VANISHING GIRLS before I started so I was pretty anxious to jump in once I had decided the time was right! 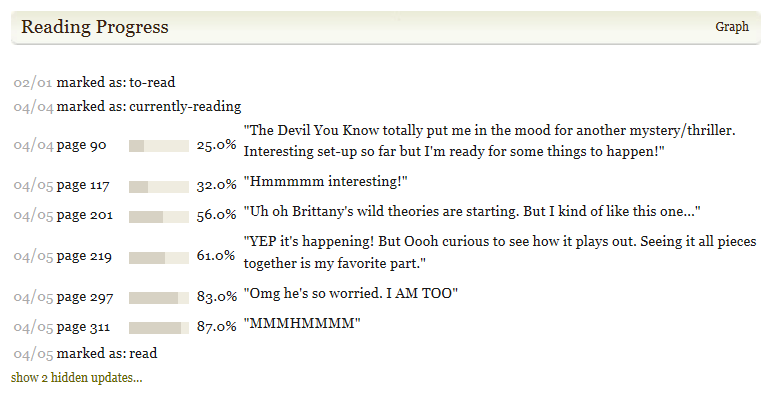 I had just finished THE DEVIL YOU KNOW by Trish Doller (review to come!) so I was in a very mystery/thriller mood and I had hoped VANISHING GIRLS would keep me on that streak! The book was really interesting but I do have to admit that I sort of waffled back and forth between being really curious and feeling a like the book was a little sluggish. I think some of that stems from my impatience whenever I read a mystery or thriller (I get too excited!) but Lauren Oliver’s writing is always a bit lyrical and her words are very carefully chosen so I tend to feel frustrated when that drags out the mystery a bit longer. That being said, I do think that it worked very well for VANISHING GIRLS (impatience and all) because of the way the story was put together and how the ending came to be. The relationship between Nick and Dara was really interesting. I really wasn’t sure at first why the two POVs were necessary, plus a constant switch from past to present, but it ended up not feeling as jarring towards the middle of the book and felt downright necessary towards the end. I also had a hard time in the beginning just getting into the book because I’m always greedy for immediate mysteries and clues to present themselves when I know something is coming, so I always hope for just a touch of something to really hook me at the start. The first half of the book felt a bit slow and I felt like there was a lot of time spent developing the story between the two girls which in retrospect the reader does need in order to fully understand them both BUT it did feel like a lot of set-up and so it dragged for me just a little bit. I was able to predict the ending but I also think that I picked up just the right amount of clues. I didn’t really start forming theories until about halfway through and by that time I think the readers are supposed to be picking up what’s going on. Nick is hot on the trail of the “vanishing girls” (including her sister) and the reader starts to realize what happened even before Nick does so it’s a really interesting dynamic to the book! It was actually really neat to see everything come together and the fact that I was able to guess how the book ended really didn’t affect my reading experience negatively. Actually, it allowed me to seeing a wider perspective than just Nick or Dara’s POV so it was really cool to put those pieces together and watch the ending unfold around them. I was hoping for a BIT more thrill from VANISHING GIRLS but it was a really interesting story! I love mystery/thrillers and Lauren Oliver threw in some nice twists for the reader! I think if you don’t pick up the clues, the ending will SHOCK you and if you do, it’s still a ton of fun! Nick // Character Obsessions: Reconnecting with Dara, family, keeping the peace. Nick seems a lot like me. Dara was the more adventurous sister and Nick was much more reserved, followed the rules, and really wanted to keep the peace between everyone. She didn’t like to rock the boat when it caused fights, even at the expense of her own feelings. But I also loved how much she missed her sister when the accident fractured their relationship and how much she really wanted to patch things up. She was really persistent to repair that relationship and it really meant a lot to her. Kept Me Hooked On: Lauren Oliver. I’m not gonna lie… I still feel a bit let down with REQUIEM since I fell head over heels for DELIRIUM and it was one of the books that got me reading YA. I still haven’t read ROOMS or PANIC (although I want to) so this is the first book I’ve read since the Delirium Trilogy and I really wanted that magic to come back. I did enjoy the book so that was good but it wasn’t quite as much as I had hoped. I kind of want to revisit Lauren Oliver’s writing but back in a non-contemporary book. I haven’t really had success with her more realistic fiction. Left Me Wanting More: Thrills. I really enjoyed the overall story but I really wanted to be hooked in by more thrills! The ending was really great but the pace didn’t really pick up until halfway through. I just prefer things to be a bit more spaced out throughout the book to hold a reader’s attention! I feel good about the book overall, but the beginning was a touch slow for me. I wished I had fallen in love a bit more but I do still recommend it to those looking for a fun mystery/thriller! This entry was posted in Books, Mystery/Thriller, Review, YA and tagged Books, Lauren Oliver, Mystery/Thriller, Review, Thriller, Vanishing Girls, YA, Young Adult on April 27, 2015 by Brittany. I was SO NERVOUS to start REQUIEM!!!! I’ve heard quite a few mixed reviews from fellow bloggers and I was positively terrified to read the conclusion to one of my favorite trilogies/series, especially when quite a few people were disappointed in it. So where I my opinion shake out? I liked it more than I liked PANDEMONIUM but it still didn’t compare to when I first fell in love with DELIRIUM. So let’s talk! One of the things I was the most apprehensive and yet curious about was the fact that REQUIEM is alternating chapters between Lena’s POV and Hana’s POV. I read the short story about Hana and was quite intrigued but I wasn’t quite sure how the book would shake out hearing her side of things. When it came down to it, I really enjoyed the alternating narrators. From Hana we get the view of Portland through the eyes of a Cured. Everything we see is much more organized and calm versus Lena’s passion and her messy, ferocious approach to life in the Wilds. The reason I loved the dual POVs so much was because we’re back in the Portland I knew from DELIRIUM again. I got really lost in PANDEMONIUM for a while because of the unfamiliar settings (something which happens to me often in book two…) and I felt like I was anchored back to the place I first met these characters and all of the emotions I had when reading the first book. It also pains me a little to say that I kind of liked Hana’s story line better than I liked Lena’s. I still felt a little lost in the Wilds and I think with Hana being anchored in Portland and unraveling a mystery of her own, I actually latched onto her story more than Lena’s more chaotic one. Another thing I was nervous about was Lena’s affections for both Julian and Alex. I’ve been Team Alex all throughout PANDEMONIUM but guys… Julian start to grow on me and I did NOT see that coming. Lauren Oliver does a great job of making the reader like Julian; he’s a good guy who got himself tangled with a girl who loves someone else and sometimes you can’t help but feel for him. My feelings actually got a bit mixed up and turned around throughout REQUIEM. I wanted to root for both guys, but at the same time, my heart was still on Alex’s side. It’s a very interesting love triangle (FOR ONCE) and it’s one that I feel was actually done well because this may be the first time I almost had a hard time picking which guy to root for! As far as the plot goes? All dystopians seem to reach a point nowadays where the fight vs. the “Society” gets a little too political for me. Since we’re seeing REQUIEM from the eyes of two girls who are closely related to the political side but still somewhat on the fringes of it, the whole resistance movement and constant battle made it a bit easier to stomach. We see a lot of battles that are lesser parts of the war and REQUIEM leads us to how this whole war wraps up. I won’t say anything specifically about the end, but what I WILL say is that it all ended a bit too quickly for me. Lena & Hana are obviously in their own worlds, telling their own stories, but I was constantly anticipating when they would collide and intertwine. I wanted a little more interaction between the two stories to really tie the whole book together. Once they finally do meet up, I was like, “NO WAY there’s still so much that needs to happen and there aren’t that many pages left!! !” I was loving the action that was going on and I wished we had spent a little more time there than in the Wilds, yaknowhatImean? Anyway, overall, I liked the book — not quite to the point of adoring it like I did with the first book, but of course it’s a must-read for fans of the series. I can see where other people were disappointed but I did still enjoy it, even though there were a lot of things I was disappointed with. Lena: As much as I always love Lena, I will always miss the Lena of Delirium – What made that book so great was watching her transform from naive and cautious to taking a huge chance on Alex. Throughout Pandemonium and Requiem, obviously we see a hardened Lena and of course I still love her but it’s still just never quite as enjoyable as the first book. I did see a lot of REAL emotions come from her though, especially regarding her decisions between Julian and Alex so that really made Requiem great. Hana: I loved hearing more from Hana in her own point-of-view instead of reading things as Lena sees them. Even though Hana is Cured, I really think we see a great range of feelings from her and even if they’re not feelings, they’re calculated ideas and thoughts which are carefully broken down into logic. The logic may not always be what Hana wants to hear, but that makes the story more exciting as well. I think it’s great to see a POV from a Cured and see exactly how the cure works and affects emotions. Hana may not be typical of all Cureds, but either way, I loved hearing from her. I really felt like her story was actually more interesting than Lena’s! If you’ve made it this far in the series, might as well complete the read! I’m still pretty disappointed in the ending and it wasn’t my favorite, but it’s worth the read to see how the trilogy ends! This entry was posted in Books, Dystopian, Review, YA and tagged Books, Delirium, Dystopian, Dystopian, Lauren Oliver, Pandemonium, Requiem, Review, YA, Young Adult on March 4, 2013 by Brittany. Lena's mother, Annabel, has always been a mystery—a ghost in Lena's past. Until now. Discover her secrets in Lauren Oliver's brilliant original digital story set in the world of New York Times bestsellers Delirium and Pandemonium. Lena Halloway's mother, Annabel, supposedly committed suicide when Lena was only six years old. That's the lie that Lena grew up believing, but the truth is very different. As a rebellious teenager, Annabel ran away from home and straight into the man she knew she was destined to marry. The world was different then—the regulations not as stringent, the cure only a decade old. Fast forward to the present, and Annabel is consigned to a dirty prison cell, where she nurtures her hope of escape and scratches one word over and over into the walls: Love. But Annabel, like Lena, is a fighter. Through chapters that alternate between her past and present, Annabel reveals the story behind her failed cures, her marriage, the births of her children, her imprisonment, and, ultimately, her daring escape. It’s a short story so I’ll just give some quick thoughts! So far, I’ve loved these little short stories that give us more info about the characters in the Delirium trilogy. When I read HANA, I was left wanting a bit more from the story but reading ANNABEL kind of filled in some gaps and made the whole trilogy that much richer. Not only do we get to hear about Lena’s mother Annabel before Lena was even born, but we also get a little bit more background on the new set of rules and regulations surrounding the cure and how society is changing once and for all. I thought it was great to see how similar Lena and her mother are yet they’re still two very distinct characters. As always, I love Lauren Oliver’s writing. The beauty of it just touches me and makes me dive head first into the story. It gave me a little taste of her writing again before I’m able to pick up REQUIEM, and if you’re wondering, NO I did not read the REQUIEM teaser at the end. If I start that, I’m just going to want more. I’ll wait (I’m)patiently for a copy! Annabel: Annabel is fierce and strong, making decisions for herself and not just going with the flow like the rest of the world. I loved her determination and her spirit. Lena is truly her mother’s daughter! I really think this little piece of Annabel will really help shape the rest of the series. Conrad: YES, we even get to hear more about Lena’s dad! I actually found this to be one of the more interesting points of the novel and how Conrad and Annabel ended up being together when she was not cured and he was. Very great addition. If you like the DELIRIUM trilogy, I would recommend this novella. I really love learning more about the backgrounds of these books as well as meeting old characters to create a new story. This one was fascinating! This entry was posted in Books, Dystopian, Review, YA and tagged Annabel, Books, Delirium, Dystopian, Lauren Oliver, Novella, Review, Short Story, YA, Young Adult on January 3, 2013 by Brittany.